Proponents of the Keystone XL pipeline regularly claim that the pipeline will replace heavy oil from Venezuela and elsewhere if it is built. In fact just this week, Rep. Lee Terry (R-NE) claimed that Venezuela’s recent offer of asylum for whistleblower Edward Snowden is somehow a reason to approve the pipeline. 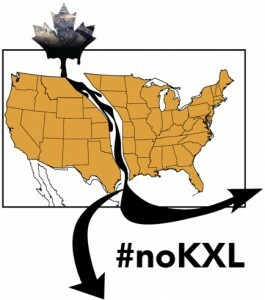 The reality is that crude delivered by Keystone XL will not replace anything. Venezuela, Mexico, and Saudi Arabia own roughly half of the heavy oil refining capacity on the U.S. Gulf Coast. These refineries will largely continue to refine their own oil, and Canada’s tar sands crude will have to compete with other suppliers of heavy oil for what’s left of the market. As the Gulf Coast transitions to a buyer’s market, a result of the U.S. oil boom and increased pipeline capacity, refiners will have their choice of crude suppliers vying for a piece of the market. In short, tar sands producers plan to exploit a loophole in U.S. crude oil export regulations and export tar sands crude oil into the global market from U.S. ports. The Keystone XL pipeline unlocks this loophole. This is the conclusion of our latest briefing released today. The briefing draws from analysis submitted to the State Department in June, in which we dismantled the market analysis in State’s draft environmental impact statement published in March. The 50-page letter submitted by Oil Change International, Sierra Club, NRDC and other partners, requested State to rewrite the market analysis. This updated analysis of how Gulf Coast crude oil markets really function is in complete contrast to everything the Department of State, TransCanada and various Keystone XL pipeline proponents have been telling the public. They say there is a shortage of heavy oil supply on the Gulf Coast and that Keystone XL will bridge the gap. The truth is that Keystone XL will create a surplus. They say that Keystone XL will “replace” heavy oil supply from Latin American and Middle Eastern suppliers. The truth is Canadian tar sands producers will export their dirty crude to the world market. This is the complex reality of the Gulf Coast oil market, in stark contrast to the simplified analysis of the State Department and rhetoric of KXL proponents. That analysis was substantively criticized in a letter to State from Rep. Waxman (D-CA) and Senator Whitehouse (D-RI) this week. U.S. crude oil export regulations restrict exports of American crude oil to Canada only. But Canadian oil can be exported around the world from the U.S. provided it has not been blended with any U.S. crude. The U.S. crude export restrictions make America’s new light oil production a bargain for U.S. refiners as it can be bought at a discount. Gulf Coast refiners are actually reducing their processing of heavy oil and increasing their intake of cheap domestic light oil — something the State department said would not happen. Heavy oil imports are down over 20% on 2011 figures. There is no reason to believe that Venezuela, Mexico, and Saudi Arabia have any intention of using Canadian heavy oil when they can run their own heavy oil and thus maximize their profits. In many cases their production and transport costs are lower than those for tar sands producers, and they are thus more likely to aggressively compete in the rest of the Gulf Coast market than retreat from it. The U.S. oil market, particularly in the Gulf Coast, has changed fundamentally since Keystone XL was first proposed six years ago. The tight oil boom combined with the prospect of massive pipelines from Canada to the Gulf Coast are at the heart of these changes. The idea that refiners will choose to buy Canadian oil because Canada is a friendly neighbor is not supported by any data or analysis – it is simply a talking point. Refiners will do as they have always done and buy the crude that will afford them the most profit, which will clearly not always be Canada’s dirty oil. Building Keystone XL will actually create a surplus of heavy oil on the Gulf Coast and force Canadian producers to regularly export their dirty oil into the world market. It is therefore clearer than ever that Keystone XL will facilitate more tar sands production and the increased Greenhouse Gas pollution that goes with it. Building the pipeline will clearly not meet the criteria of no significant increase in carbon emissions set by President Obama. The sooner that Democrats and Republicans wake up to the fact that Big Oil works only in its own interest and not in the national interest, the sooner we may start to move towards the clean energy future we so desperately need.